Kumquat-Saffron Bonbons by Marijn Coertjens at The Peninsula Hotel, Hong Kong. 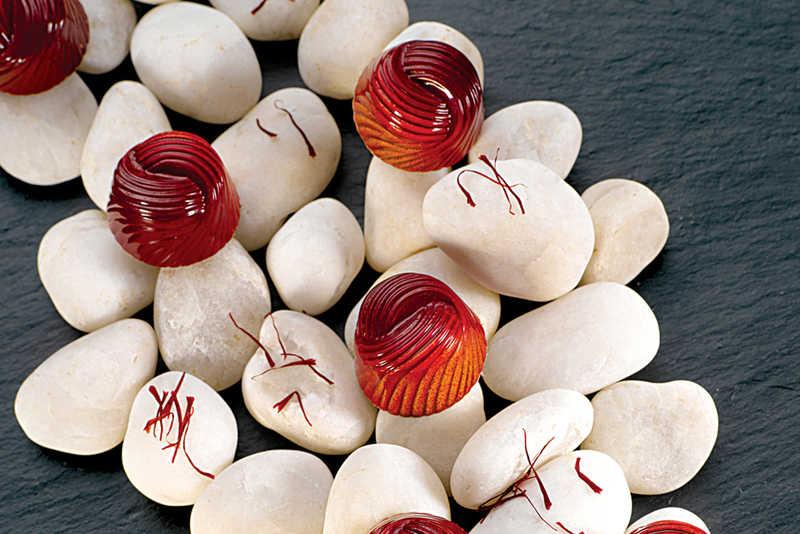 Hong Kong’s celebrated luxury hotel group, The Peninsula Hotels, have a long history of producing fantastic chocolates. Marijn Coertjens, the group’s Maitre Chocolatier, shares one of his new creations. In 1954 The Peninsula Hotels group started selling their well-known branded chocolates to the public. In 1955 they sold a total of 100 kilograms in the year. Today they sell 50 kilograms a day at their chocolate boutique, the Chocolate Room at the Kowloon property. The ‘artisanal’ single-origin and ‘signature’ ranges are all made under the watchful eye of Marijn Coertjens at the flagship Hong Kong property. 1. Place the cream, salted butter and saffron in a saucepan and heat without boiling. 2. In a separate saucepan, caramelise the sugar. 3. Once the sugar is golden brown, add the hot cream little by little. 4. Mix well to ensure that the caramelised sugar is totally dissolved. Place back on the heat if necessary to dissolve the caramel. 5. Allow the caramel to cool. Set aside. 2. Place the chocolate and trimoline in a bowl. 3. Place the milk in a saucepan and bring to the boil over a medium heat. 4. Pour the milk over the chocolates and trimoline. 5. In a separate saucepan bring the orange juice and kumquat puree to the boil. 6. Pour the liquid through a sieve onto the chocolate mixture. 7. Mix by hand until the chocolate is melted. If it is not completely melted, place briefly in a microwave oven. 8. Once the chocolate mixture reaches 35C, add the butter and mix until it is a smooth and shiny ganache. 9 Spoon the ganache into a piping bag and set aside. 1. Spray one side of the mould with yellow-coloured cocoa butter and the other side with strawberry-red coloured cocoa butter. 2. Cast the mould with tempered chocolate (the type of mould can be changed). 3. Spoon the saffron caramel into a piping bag and pipe a small amount (approximately 7.5 g on top of the saffron caramel). 4 Place mould in the refrigerator for 15 minutes to set the filling. Seal with tempered chocolate.